On the bright side, I haven't invested any time to increase this figures, this's been totally passive income, which is great. Finally after 25 days I sold my shares, and made a 13.98% overall profit. I entered at 147.34, and left at 172.17, not bad for a complete rookie. Some say this is a bubble which will burst anytime, others that we are only seeing the rise of china, and this is a one in a lifetime opportunity. What do you think? It´s funny because no matter what you do, you can always back it up with some experts opinion, and at the end of the day you move based on what your guts tell you to do. I only hope tomorrow falls, so I can pick it up cheaper. I'm not really doing much to increase my earnings online. I've been more focused on my day job, and other activities, but still I love the passive income aspect of making money online. Any tips to make this number increase ten times? 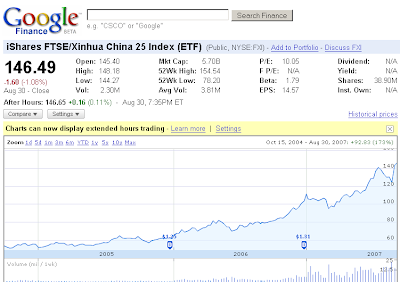 I´ve followed one of my friend´s advice, and I bought some stocks, actually they are ETF, that follow the chinese market. 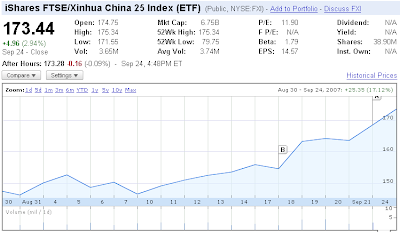 The fund is called iShares FTSE/Xinhua China 25 Index (ETF). My rationale was this: China market is on the rise, and will be for a number of years to come, and the progression so far of this fund is just awesome. I´m a complete newbie on this field, but there has to be a beginning to everything, right? So that you know, my expectancies are around 30% a year. What do you say? Will it make it? Any tip to share?